The smart P-controller is a Remote Access Device Controller with 4 clean relay contacts and 5 serial ports. 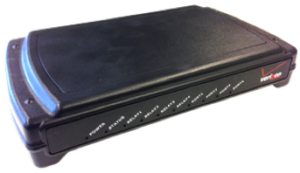 4 serial ports can be used to remotely access 4 external devices, such as Universal GSM/GPRS M2M Terminal network routers and other appliances. The Remote Access Device Controller can be equipped with 1 to 4 universal Remote Power Switches that can be used to remotely control the power up to 4 external devices, such as network routers. The Remote Power Switch unit supports universal IEC320-C14 type input and IEC320-C13 output connectors to easily fit between the power cord and the device under control. The P-controller automatically detects the presence of the connected Remote Power Switch. The P-controller can be used as a stand-alone PC solution or in combination with a U-router, G-router or C-router.